I just love Fall outdoor Artisan Markets! I was out on a date with my hubby and we came across an outdoor craft market and all of the colors on the tables displaying their work lured me in. One table had some cute little knit hats and ear warmers and it reminded me of my unfinished project list from last year on that list #44 Ear Warmer Headband. I got right to making my easy NO KNITTING Fashionable Ear Warmer Headband project so I can scratch it off my list. I admire those who can knit but this girl has NO knitting skills. Anthropologie had a similar headband but it was knitted. See it's already so easy. Cut your piece of fleece the width you want the headband. Yay, I got to use my Fiskar cutter for the first time! Mine was about 4.5 inches wide. Since fleece is so wonderfully stretchy this works great for a headband. Wrap the piece of fleece around your head to figure out where to cut. Then sew the 2 long ends together. Hemming is not needed since fleece doesn't fray but if you are in the mood pull out that sewing maching and have at it. I cut a long piece of fleece about an inch wide to make my flower. Roll and sew as you go so it stays in place. You can also just cut out flowers in different sizes and stack them up on each other like this here. This is such a great idea!! And it turned out darling!! I love projects that require little or no sewing and I love anything and everything Anthro, so this is perfect for me! 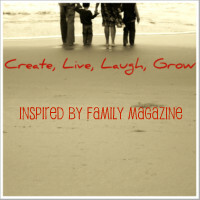 :) We have a link party every Saturday on our blog and we would love to have you come share this. You have a fun blog- I am having so much fun checking out all your great posts! Have a good night! SO cute and a great tutorial! Pinning this to my Christmas gift board! camille, yes I am with you. I will try to remember to stop by on Sat. Lauren, I know I am going to give a lot of these out as teachers gifts. L-O-V-E this! There have been so many great sales on fleece lately....I've been looking for a reason to buy some :) Thanks for sharing your awesome + creative idea! Thanks ladies for the love and the feature! flattered!